Born an impoverished free man in a strongly class-conscious society. Farm worker, field labourer, and mat maker. Married layman with no children. A mystical and religious man even as a pagan, he became an adult convert to Christianity around age 50, taking the name Juan Diego. Widower in 1529. Visionary to whom the Virgin Mary appeared at Guadalupe on 9 December 1531, leaving him the image known as Our Lady of Guadalupe. Educated at the University of Pont-a-Mousson, entering at age 15. Tutor to the sons of many noble families. Augustinian Canon Regular at the abbey in Chaumousey, France. Ordained in 1589. He returned to university, became a master of patristic theology, and could recite the Summa Theologica of Saint Thomas Aquinas by heart. Reforming priest at Mattaincourt, Vosges, France, an area noted for corruption and lax attitudes to heresy; he revitalized the spiritual life of the district, and established charities and banks for the poor. Spiritual teacher of Blessed Alix le Clerc. In 1598 he founded the Daughters of Our Lady for the education of girls. Founded the Sodality of the Immaculate Conception, or Children of Mary. His attempt to found a parallel order to teach boys failed. In 1621 he was ordered to reform his order in Lorraine. In 1625 he was sent to Salm to preach missions and work against Calvinism; within six months all the fallen away Catholics had returned to the Church. Helped found the Congregation of Our Saviour in 1629 and served as its superior general in 1632. When the French government ordered him to swear allegiance to King Louis XIII he refused, and spent the rest of his life in exile in the town of Gray, Haute-Saone, France. Raised a Protestant, he studied in Mühlhausen, Leipzig, Gotha and Strasbourg, then in 1621 began studying with Jesuits in Würzburg, Germany where he converted to Catholicism. Ordained on 29 March 1625, Liborius served as chaplain in Hardheim, Germany, then as parish priest at Altenmünster, Germany a predominently Protestant city. He ministered to everyone in his city, and his example brought many Protestants to re-union with the Catholic Church. In 1631, the Protestant Swedes, fighting in the Thirty Years' War, reached Altenmünster, and Father Liborius was forced to flee the city; he hid in Reichmannhausen, which was only couple of miles away, so he could return to minister to his parishioners. On 4 December 1631 he was betrayed, captured by the Swedes, tied behind a horse, and dragged several miles to the castle of Mainberg where he was subjected to several days of torture to force him to renounce the Catholic Church; he refused. Martyr. Novice in the Poor Clares of Todi, Italy at age 15, and took her vows under the name Clara Isabella at 16. Given to long and frequent ecstatic visions of Jesus, Our Lady, Saint Clare of Assisi, and Saint Catherine of Siena. During one of these, Jesus placed a ring on her finger, and pronounced her his "spouse of sorrow." Stigmatist, with constant marks and periodic bleeding. Her head was weighted with a mystical crown of thorns that invisibly, but painfully, grew through the skin until the thorns popped through and fell, leaving bleeding open wounds. Driven to depression and despair from the pain, she was tempted to apostasy and suicide. Toward the end of her short life she even lost the memories of her earlier, consoling visits from Heaven. However, not long before she died the memories of those earlier, ecstatic times returned to her, her joy in God returned, and she went happily into the next life. Missionary sent by Pope Saint Fabian to take the faith into Gaul in the 3rd century, centering his work around the modern Auvergne, France. Worked with Saint Austremonius, Saint Gatianus of Tours, Saint Trophimus of Arles, Saint Paul of Narbonne, Saint Martial of Limoges, Saint Dionysius of Paris, Saint Baudimius, Saint Auditor of Saint-Nectaire and Saint Saturninus of Toulouse; may have been related to Baudimus and/or Auditor. Turned a pagan temple into the new Christian church. Martyr. Slave. Beaten and imprisoned for refusing to denounce her faith during the Diocletian persecutions. Scheduled for torture and either apostasy or martyrdom, she learned of the abuse being suffered by the 13 year old Saint Eulalia of Merida. 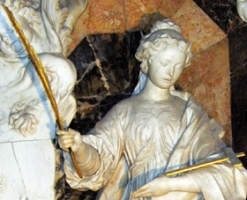 Leocadia prayed for God to remove her from a world where such evil occurred; she died soon after, of no particular cause, without being touched by her torturers. Ancient and popular cultus developed in Toledo, Spain. Born a prince, the son of a king of Brittany; his mother was Azenor, princess of Brest, France. Legend says that his mother was set adrift in a cask, and that Budoc was born at sea with Saint Brigid of Ireland in attendance. Educated in a monastery near Waterford, Ireland. Abbot at Youghal, Ireland. 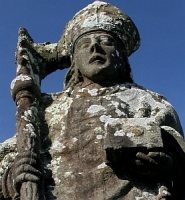 Bishop of Dol, Brittany for 26 years. Several places in Devon and Cornwall in England are named after him. Evangelized and served as first bishop of Pavia, Italy in the 1st century; tradition says that he was appointed by the Apostles, and an old legend says that he was the boy with five loaves who appears in the Gospels. Worked with Saint Juventius of Pavia. Fought Arianism. Daughter of Saint Gregory of Nazianzen the Elder and Saint Nonna. Sister of Saint Gregory of Nazianzen and Saint Caesarius of Nazianzen. Married, and mother of three. Twice miraculously cured of serious maladies, one of which resulted from being trampled by a team of mules which broke bones and crushed internal organs, and the other whose symptoms included headaches, fever, paralysis, and repeated coma. Each was cured by the strength of her prayer. Daughter of an imperial Roman senator. Convert. Spiritual student of Saint Martial of Limoges. Betrothed in an arranged marriage, she said that she wanted to devote herself to God; her fiancee refused to believe it, assumed she had another lover, and killed her. Martyr. Possibly apocryphal. Missionary sent by Pope Saint Fabian to take the faith into Gaul in the 3rd century, centering his work around the modern Auvergne, France. 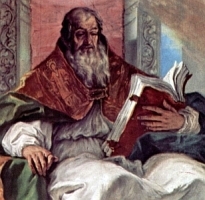 Worked with Saint Austremonius, Saint Gatianus of Tours, Saint Trophimus of Arles, Saint Paul of Narbonne, Saint Martial of Limoges, Saint Dionysius of Paris, Saint Baudimius, Saint Nectarius of Auvergne and Saint Saturninus of Toulouse; may have been related to Baudimus and/or Nectarius. Bishop of Verona, Italy. Made public confession of his faith during the persecutions of Diocletian, for which he he was harassed, beaten and run out of town. He eventually returned to resume leadership of his flock. Princess, the daughter of King Alfred the Great. Nun. With her father's help, she founded and served as first abbess of Shaftesbury Abbey in Dorset, England. Sixth century monk at Périgueux, France. In late life he became a hermit on the banks of the River Dordogne. Saint Gregory of Tours wrote a biography of him. Late 7th century abbess in Jouarre Abbey, diocese of Meaux, France. First century convert. Spiritual student of Saint Paul the Apostle. One of the 72 disciples sent out to spread the faith at the beginning of the Church. Bishop. Hermit at Saint Benet Hulme in Norfolk, England. First century convert. Spiritual student of Saint Paul the Apostle. One of the 72 disciples sent out to spread the faith at the beginning of the Church. Third century bishop of Apamea, Syria. Worked against the Montanist and Kata-Phrygian heresies. The memorial of ten Mercedarian friars who were especially celebrated for their holiness. Twenty-four Christians murdered together in North Africa for their faith. The only details to survive are four of their names - Bassian, Peter, Primitivus and Successus. Seven martyrs crucified in 297 in Samosata (an area of modern Turkey) for refusing to perform a pagan rite in celebration of the victory of Emperor Maximian over the Persians. They are - Abibus, Hipparchus, James, Lollian, Paragnus, Philotheus and Romanus.